Bowlero Milpitas puts a hip, new spin bowling, games, private events, and everyday fun for everyone in Santa Clara County. Experience the best in blacklight bowling on 40 lanes featuring plush lounge seating, huge video walls, and convenient laneside service. Our Milpitas location also boasts some seriously cool arcade games—from World’s Largest Pac-Man and Jurassic Park Arcade to MotoGP motorcycle racing, Sink It!, and other cutting-edge titles. Challenge your friends to air hockey, practice your jump shot on multi-player NBA Hoops basketball, or just goof off with your besties in our interactive photo booth. 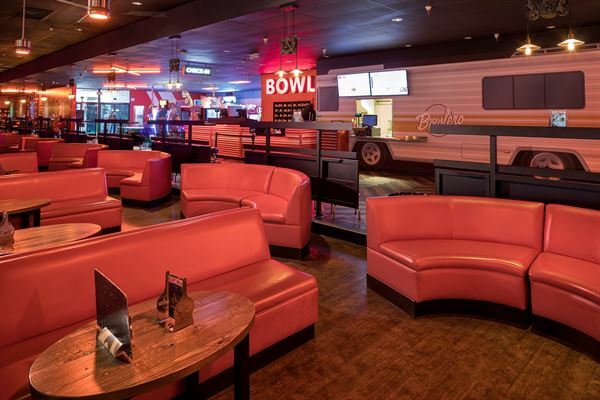 At Bowlero Milpitas, bowling is just the beginning. At Bowlero, striking events are easy to arrange and even easier to enjoy. Whether you’re planning the coolest kids’ party ever, a high-energy bowling bash for your friends, a bride-approved bachelor party, or a corporate event that rocks the cubicle, you’ll find no better place to celebrate.